The annual Christmas Muay Thai interclub will be held on level 8 of the union on the 12th of December at 8pm. 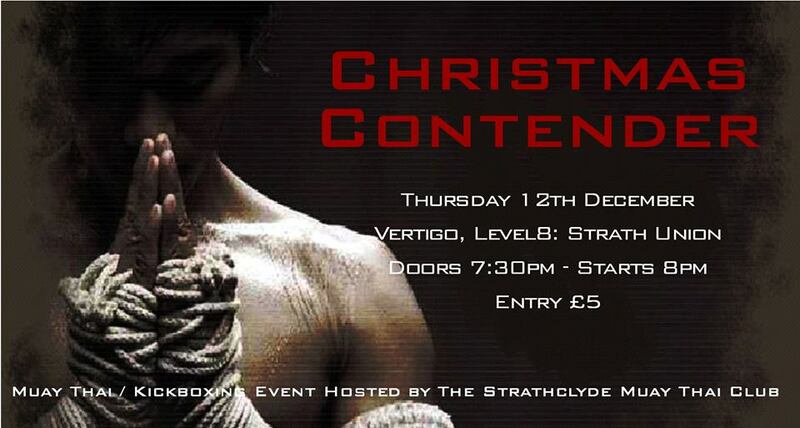 ‘The Christmas Contender’ will see exhibition fights between fighters from Strathclyde, Glasgow, Glasgow Caledonian, Edinburgh and Stirling Universities as well as competitors from independent martial arts gyms such as The Griphouse and Clan Muay Thai. The night will consist of over 20 Thai exhibition fights with both men and women competing, the MMA club have also joined the Christmas Contender and there will be several mixed martial arts fights on the card as well. Club captain Stefan Madzarac, himself fighting, commented on the upcoming event. “We’re fielding about 15 fighters from the club to fight on the 12th, for some it will be their first ever fight, and some others have had several. We have a range of experience on show and will be hoping for some good displays; the main universities will be sending fighters down as well as some from different martial arts gyms.” Strathclyde will host the first of the Glasgow interclubs and will aim to put on a superior display before competing at the Glasgow University and Caledonians events which will follow. Regarded as perhaps the most efficient martial art for striking, Thaiboxing is a massively fast growing sport and its presence has grown exponentially across UK universities, with a vast number running their own clubs. Stefan encouraged anyone who was curious about starting to do so “If you’re new to it you will notice such a difference in fitness and technique after even just one semester, and it’s a great discipline. We have quite a lot of women who train with us as well; it’s not just for men. We train Mondays and Thursdays in the Royal college gym and have a very experienced coach who has fought at the highest level”. For a nominal £5 you are guaranteed an entertaining and competitive show at the first of the Glasgow Thai interclubs with doors opening at 7:30pm on vertigo, level 8 of the Union.